In September 2012 Christie’s will present ‘Of Sand and Silk’, the first European solo-exhibition of the prominent Russian artist Alexander Volkov (1886-1957). Volkov was born in the Fergana valley into the family of a Russian military doctor. 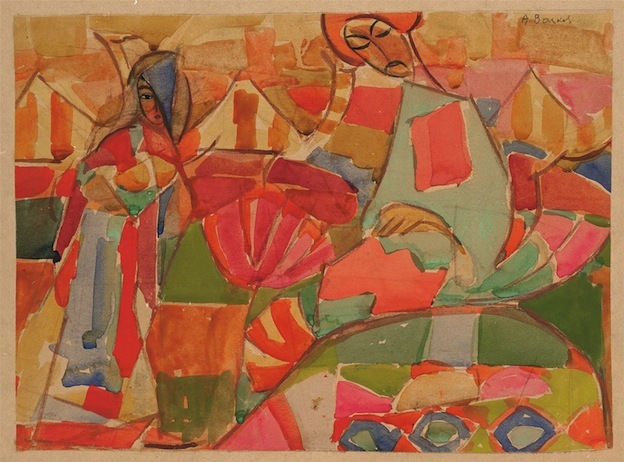 He achieved significant lifetime recognition for his depictions of Central Asia, his paintings uniquely combining cutting-edge Western painterly styles with the inspiration he drew from traditional Central Asian craftsmanship. Volkov loved his homeland passionately and often repeated: “One does not need the whole world. A small part will suffice”. Despite the artist’s experimentation with colour and form in the spirit of the Cubofuturists and Expressionists, Volkov always remained true to his artistic goal of representing reality in all its complexity. As such, Volkov’s works provide a glimpse into Central Asia at the beginning of the twentieth century, with all its multitude of vibrant colours, sounds and smells. Interestingly, while his depictions of human figures look stylised to a Western eye, Volkov’s Uzbek neighbours and friends easily recognised themselves in his work. When considering Volkov’s paintings from the 1930s, one observes the increasing presence of female figures, an aspect almost entirely missing from his earlier works with the exception of portraits of his wife and imagined scenes of women bathing. The testimony of early twentieth century travellers confirm their absence in everyday life outside the home: the Russian artist Kuzma Petrov-Vodkin (1878-1939), who visited Samarkand in 1921, wrote to his wife: “I am in Samarkand… The most curious thing here is the absence of women.” Confined to the domestic sphere and to female quarters even within their own home, on the street women hid behind paranjas (Central Asian robes for women covering the head and the body). With the advent of Soviet power however, Muslim traditions and, wearing paranja in particular, were perceived as harmful remnants of the past. Thereafter women were encouraged to work and as a result occupied a more visible place in Uzbek social life, a transformation which, like so many aspects of the new Soviet society, was reflected in Volkov’s work. Alexander Volkov: Of Sand and Silk, a non-selling exhibition at Christies, 8 King Street, St James’s, London from 4-21 Sept 2012, 10am-5pm daily (free public entry).